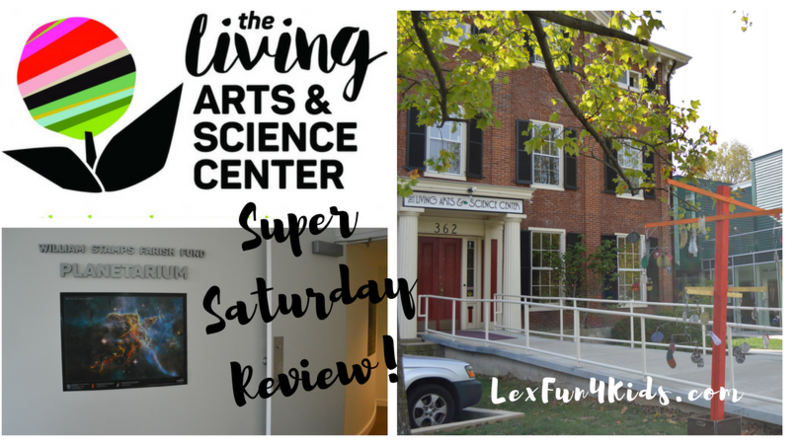 The Living Arts and Science Center is a wonderful addition to the downtown Lexington area. If you haven’t ever explored this special place a Super Saturday event is a perfect opportunity for you and your family to enjoy fun as well as learning! Discovery Saturdays are held on the 4th Saturday of the month throughout the year (exceptions may happen due to holidays). It’s a great day for a great price – it’s hours of fun! The LASC just underwent a huge renovation and addition project and now features much more space. They have new classrooms, a new permanent planetarium with shows rotating throughout the year, small gift shop, art gallery and more! 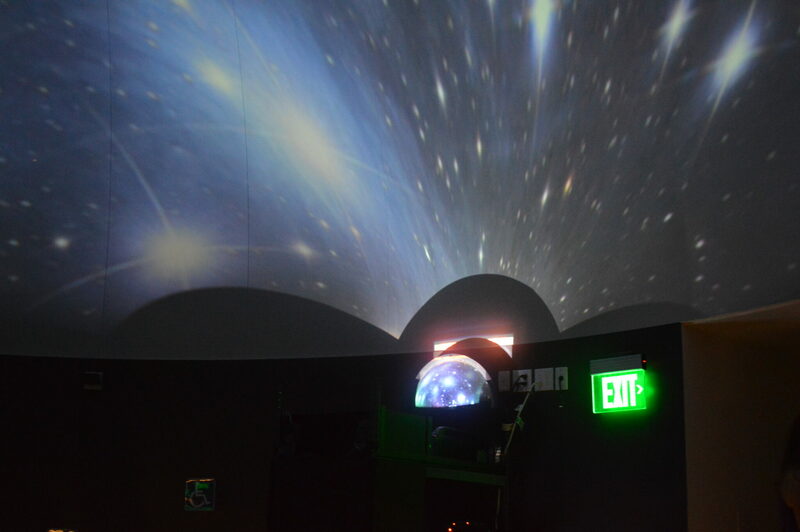 Discovery Saturday is held from 10 am – 2 pm with planetarium shows at 11:00 am and 1:15 pm. You can get your planetarium ticket for the show at the front – be sure to grab one for the show you’d like to see when you arrive because space is limited. They also just added new workshops available for each event. Register early for those as well! 5 Cool Things at Discovery Saturday! The featured exhibit! Enjoy hands on fun as you create and build! Play! Get your creative juices flowing with cool educational games and activities for all ages to enjoy. Art exhibits! Check out all the artwork around the facility by local students as well as featured artists. You will see many different mediums, styles, and more. Great for discussion! The outdoors! Enjoy a walk around the grounds. There are outdoor art displays, beautiful landscaping, a water feature, and more. It’s such a fun place for a picnic or a short walk. Stars and planets of course! The new planetarium is a cool way to see the night sky. With special shows that change with different events be sure to go back and see different shows. You can grab a chair or lay on the floor and gaze up at the show. This one is great for all ages! The 4th Saturday of every month is Discovery Saturday at the LASC! Science exhibits, art exhibits, hands-on Makers Space activities, planetarium shows, and choose additional fun-filled art workshops designed for all ages and skill levels. Events are $4 admission, $10 to add an AM or PM workshop. Pre-registration is suggested. Walk-ins welcome as space allows. Maker’s Space | The Science of Sound: Make a sound sandwich, tell secrets through the whisper tube, and create music with a set of singing rods. By the time you’re done, you’ll be an expert on sound and how we hear it. Explore the wonders of making music on the fly out of everyday objects. Participants learn how to build layers of sound as we explore how looping and “random sounds” can be blended together to create lush soundscapes. Create your own songs in a fun, easy, and collaborative way. $7 with free admission. Join in a family friendly hand-drumming session. All skill levels welcome. Learn basic drumming techniques as well as the health benefits of communicating through ancient rhythms. Open the heart to higher vibrations allowing deep connections to the spirit and self. Come to connect with others and learn in an empowering environment. $7 with free admission. The LASC offers birthday parties!! Click HERE for more information on all The Living Arts and Science Center has to offer.